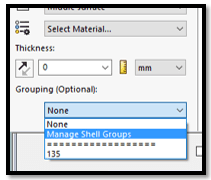 SOLIDWORKS: How the Shell Can I Manage My SOLDIWORKS Simulation Shell Elements? How the Shell Can I Manage My SOLDIWORKS Simulation Shell Elements? If you were enticed by the title of this blog, then you are probably already aware of what a shell is and why they are so valuable. For those who are not aware, they are, in this context, a 2D element used in SOLIDWORKS Simulation. I will not bore you with too many details about shell elements, but instead show you some nifty techniques to help you manage and create shells more efficiently. Shells are defined by manually inputting several properties each time a body is converted to a shell element from a solid element. Who would want to define a hundred different shell elements? Not me! 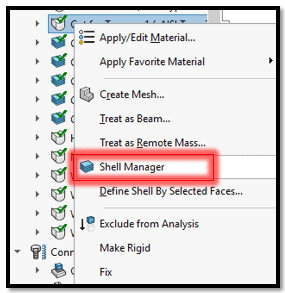 When converting a solid to a shell element, one typically clicks on “define shell by selected faces…”, but we are going to take a look at the “Shell Manager” instead. Keeping in mind that the primary concern is to find a way to define many shell elements at once, please take a look at the shell manager below. We may then select a name and choose some properties that we want associated with this group. 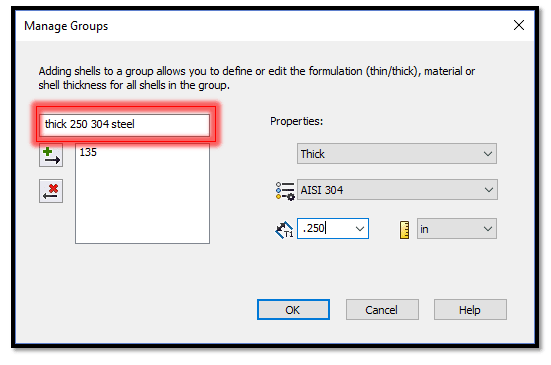 This will then enable us to select bodies and define all of the properties simply by choosing which group it will belong to. Notice that the name of the group should have some information about the properties to make it easily identifiable. Once all properties are chosen, click on the arrow with the green “+” sign and a new group will be created. Now we all know that some of our parts fail due to a high load in the simulation study. We typically need to redesign parts to make them stronger. Not so with shell elements; all that is needed is to modify the group and increase the thickness or switch to a stronger material and run a new study. All bodies attached to this group will have this new thickness and are now more likely to withstand the force without failing.